Communications Minister Jorge Rodriguez assured migrants the economic situation is improving thanks to Economic Recovery Plan. 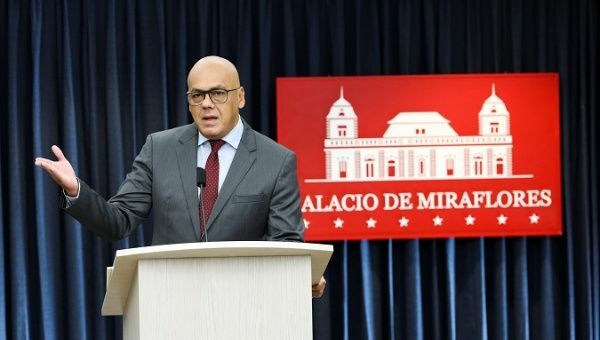 August 24 (teleSUR) Venezuelan Communications Vice President Jorge Rodriguez invited all Venezuelan immigrants, who have faced increased restrictions and xenophobia in neighboring countries, to return to the country, which he said is succeeding at stabilizing its economic situation. The comments were made during a press conference Friday, where he explained the economic recovery plan had already yielded positive results. Rodriguez congratulated the business sector for collaborating with the government in efforts to stabilize the economy, particularly for the pact to establish set prices for 25 staple goods. He also announced the government is meeting representatives of other sectors, such as medicine, auto parts, and clothing to reach price agreements. An important measure to curb inflation. As evidence of the improving economic situation Rodriguez explained that in the last currency bidding process held Wednesday, after the currency reconversion plan went into effect, more people were offering to sell U.S. dollars at the price established by the government. “Today’s Beyond the attempts to distort things, the wheel of economic recovery is moving exceptionally well,” he said. During the Q&A, one reported asked for Rodriguez’s opinion of the recent statement by the International Organization for Migration, which claimed Friday that Venezuelan immigration was close to becoming a migrant crisis comparable to that of the Mediterranean. Rodriguez also pointed to the six million Colombians living in Venezuela, highlighting that interregional migration has always existed and that they coexist with the people of Venezuela peacefully. He also rejected the expressions of xenophobia both by sectors of the Colombian population and the media. “The oligarchy had managed to destroy the workers’ salaries. The president protected them. He pegged it to something that is stronger than the dollar… the price of the dollar,” Rodriguez added.